Protests and events took place around the world marking the International Day of Revolutionary Prisoners. Many of these events, including actions in Paris, Brussels, Milan, Nimes, Beziers, Tunis, Marseille and Bern, focused on the campaign to free imprisoned Lebanese Communist struggler for Palestine, Georges Ibrahim Abdallah, imprisoned in France for 33 years. In Paris, hundreds of demonstrators took the streets under the banner of the Unified Campaign to Free Georges Ibrahim Abdallah. Members of organizations including the Unified Campaign, the Party of the Indigenous of the Republic, EuroPalestine, Le Cri Rouge, Secours Rouge, OCML VP and many left political parties and organizations participated in the march. People travelled from a number of cities, including Lille, Bordeaux, Tarbes and Annecy; from Brussels, Secours Rouge was joined by a large delegation, including members of Plate-forme Charleroi-Palestine and the Communist Party of Belgium. “He is part of our struggles, we are part of his struggle. That is why the Unified Campaign calls on all those who stand side by side with the Palestinian resistance fighting the alliance of the imperialist states, the Zionist entity and the Arab reactionary states to join us in the demand for the liberation of Georges Ibrahim Abdallah, and to come in large numbers for our next events: in September at the Fete de l’Humanite and in October in front of the prison of Lannemezan,” said the Unified Campaign in a statement. In Brussels, a smaller demonstration was organized on 17 June outside the French Consulate in support of the Paris mobilization. 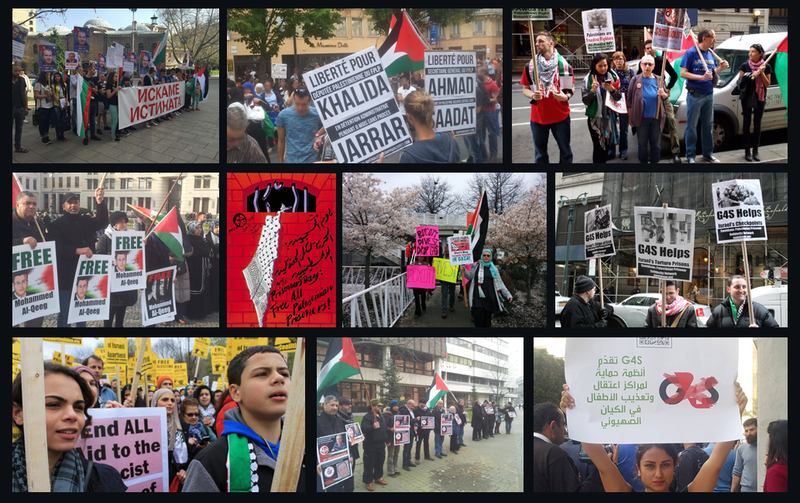 Participants received strong support from cars passing by as they held banners demanding freedom for Georges Abdallah, freedom for Palestinian political prisoners and waved Palestinian flags. Myriam De Ly of Plate-forme Charleroi Palestine spoke at the demonstration, urging the importance of building and escalating the solidarity campaign for Georges Abdallah’s freedom in Belgium. Luk Vervaet emphasized the importance of a collective struggle to confront so-called “anti-terrorism” laws that are used to repress people’s movements. Charlotte Kates, international coordinator of Samidoun Palestinian Prisoner Solidarity Network, emphasized Georges Abdallah’s struggle as part and parcel of the struggle for the liberation of Palestinian political prisoners and all political prisoners in jails around the world. In Tunis, the Tunisian Solidarity Committee for the Release of Georges Ibrahim Abdallah organized a protest on 17 June in front of the French Embassy to demand his freedom. They were met by a massive police presence in an attempt to deter the vigil organized outside the embassy. The Popular Front of Tunisia also participated in the protest vigil to demand Abdallah’s liberation. In Beziers, a group of activists with EuroPalestine and other groups created a display of information and posters in support of Georges Abdallah’s struggle for freedom on Saturday, 17 June. They were joined by fellow organizers in Nimes, who set up a table of infomation, banners and Palestinian flags to highlight the case. In Marseille, protesters displayed banners calling for freedom for Georges Abdallah and remembering Lamin Dieng, killed by French police 10 years earlier in Paris. The Revolutionäre Jugend Zürich – RJZ (Revolutionary Youth Zurich) participated in the Anti-Racism Cup football tournament in Bern, Switzerland on 17 June, where they displayed banners in solidarity with political prisoners, including one demanding freedom for Georges Abdallah. On this International Day of Revolutionary Prisoners there are many, very many in the world, those who resist behind the abominable walls. Often in particularly difficult conditions, they manage to stand up, despite many years of captivity. Certainly the situation could be terribly different if they could not count on the solidarity mobilization which supports them to inscribe their resistance on the global dynamics of the struggle. Dear comrades, dear friends, following your various solidarity initiatives that accompanied the hunger strike of our comrades imprisoned in the Zionist jails, your gathering today brings me a great deal of strength and enthusiasm. It is clear that the Zionist occupation forces have scarcely agreed to satisfy some basic demands. The imperialists on all sides and their reactionary Arab allies have begun to do everything possible to break the unity achieved during the strike. The leaks released in recent days suggest that there will be an attempt to impose a different and worse treatment on the families of prisoners. These are only reports at the moment. In the meantime, it is our duty, Comrades, to remain vigilant and denounce any policy of discrimination between Palestinian prisoners or mistreatment of their families. No matter what it pretends, the [Palestinian] national Authority will be charged to take on this dirty work. Let a thousand solidarity initiatives flourish in favor of these imprisoned flowers and lions so that their Zionist jailers understand that they will never be alone! Let a thousand solidarity initiatives flourish in support of Palestine and its promising intifada! Solidarity, all solidarity with the resistance fighters in the Zionist jails, and in the isolation cells in Morocco, Turkey, the Philippines and elsewhere in the world! Solidarity, all solidarity with the revolutionary comrades resisting in the jails in Greece! Solidarity, all solidarity with the young proletarians of the working-class neighborhoods! Capitalism is no more than barbarity, honor to all those who stand against it in the diversity of their expressions! Together, Comrades, and only together will we be victorious! To all of you, comrades and friends, my warmest revolutionary greetings. Samidoun: Freedom for labor organizer Kamal Khalil and all Egyptian political prisoners!